Virender Sehwag is not the man you want fielding at leg slip if you are a batsman or a fielder. Especially when Harbhajan is bowling from round the stumps, and turning it in. 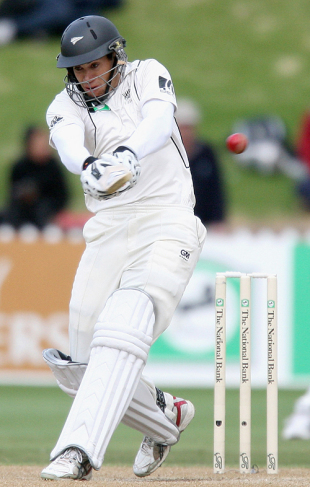 After catching Ross Taylor on the half-volley, he threw the ball way up in the air. MS Dhoni, who hadn't turned back in time, actually thought Sehwag had caught it. As did the crowd. A few overs later, Sehwag caught Taylor off the thigh pad, and threw the ball up again. He didn't throw it too high this time. No one was fooled. If you don't succeed at first, try again. Tim Southee showed the adage works when he caught Harbhajan. Southee ran in from long-leg to reach under the top edge comfortably, and then let it pop out of his hands. As he stumbled and fell, he stretched his left hand for the rebound. The ball then hit his chest and he held the ball against his neck. Rahul Dravid equalled the world record for most catches in Hamilton, but spent two days in Napier and one innings in Wellington without taking another catch that would make the record his own. Today though, he came up with a gem that befitted the world record, diving to his left at third slip, and cupping the catch cleanly. Not known to show too much emotion, Dravid just kissed the ball and returned it to the umpire. No. 183 arrived soon afterwards. In the first innings, Taylor declared himself out even though the replays, the snickometer, and the HotSpot didn't detect an edge. "I felt an edge," Taylor had said. Today, though, after hitting it to Gautam Gambhir at forward short leg, Taylor waited midway on his walk back to the dressing room. And he was proved right, with replays unable to prove conclusively that the ball had not touched the grass before reaching Gambhir's hands. Taylor is not always in a hurry to walk. Ishant Sharma is not used to fielding in the circle, and it must be for a reason. When James Franklin played Harbhajan Singh between point and cover, both Ishant and Yuvraj Singh ran towards the ball, without calling. They bumped into each other, and then kept looking at each other for about 10-15 seconds. Fortunately they hadn't been haring after it and hence no damage was done.